Plastic crates for use in all manufacturing and distribution sectors, and plastic boxes available in many different sizes, plastic boxes with lids and different solutions of plastic crates for food processing. 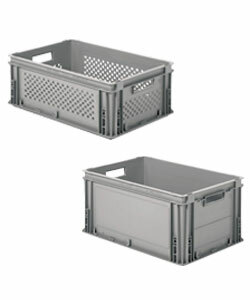 The plastic crates are made of polypropylene or high-density polypropylene (HDPE) for use at high or low temperatures, providing the ideal solution for many needs that emerge in the production and distribution processes of each sector and are an important and essential complement to integrate containers, pallets and other solutions for transport and handling. 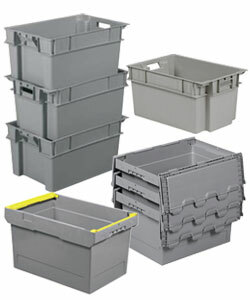 This is why we keep plastic boxes with closed or perforated bottoms and sides, with reinforced bases, plastic boxes with lids, which can be inserted and stacked, with handles for gripping in the heavier versions, which can be equipped with labels, lids and customised, available in our warehouse for quick delivery.